Anyone have pics of these liners? 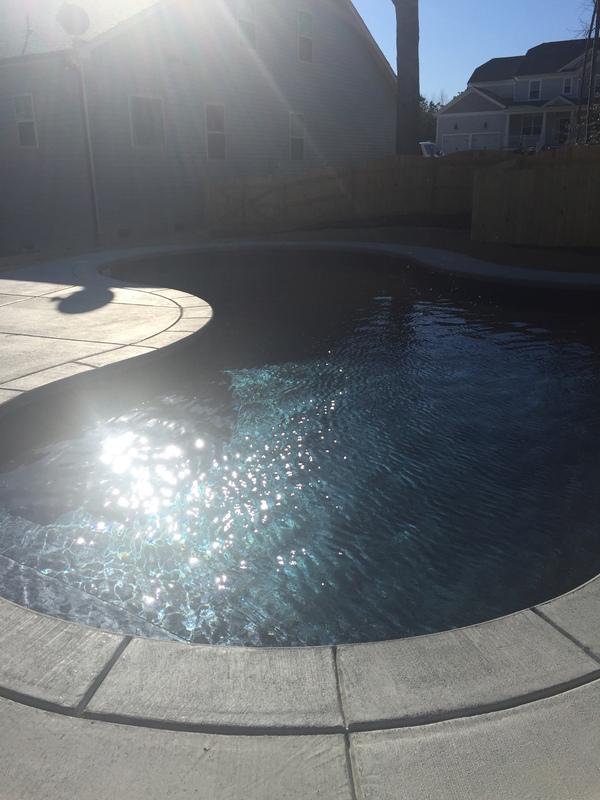 I know there is another thread with just posts of pool liners with pics but it gets very confusing when some pics don't have names. I am looking to see what the real difference is between these 2..
Also, really interested in pics for the GLI Durango with mosaic dark grey and black granite with black onyx. Pics of any of these would be helpful as I really am more concerned with the color of the water than anything else at the moment. Would u say it has turquoise in it? Yes, I would say it has turquoise in it. We absolutely love the color. Wow, I think I love it more than the gold pebble. I just worry about the tan liners looking green, that you could not tell if the pool was turning green, lol. We worried about the shallow end looking muddy under cloudy skies. We have a lot of shallow end so that sealed the deal. The gray liner has such a refreshing water color and we get a lot of compliments on it. It might just be semantics, but I don't think that pool has any look of turquoise. I've not heard anyone say that a gray liner or plaster pool looks like a color related to turquoise (greenish-blue). Browns, tans and greens yield green colors (of which I would include turquoise). If you google Steel Blue you'll see the pool above (more or less). Google turquoise and it's something quite different. That's exactly how I'd recommend doing it. It's really not as hard as people make it out to be. Surface color of white through blue yields Windex through medium blue water. Surface color of tans, browns, & greens yields greenish water. Surface color of grays & blacks yields medium to very dark blue water. There's more to it but that's the gist of it. The view that you see in the reflection of your pool from your primary viewing location can also affect it. If you see sky in your pool's reflection, the color will go towards lighter, if you see buildings or trees, it will go towards darker. If you live in Seattle, I'm sorry, don't build a pool. been started up yet and the water was just added late last week. Start up is tomorrow. Dang, I don't know why the post did that. Has it faded at all? Me? No but it was literally installed last week. Ours was installed last August so no fading at this point. The PB sales guy stopped by yesterday to bring us a gift. He remarked how good the gray skimmers look with the liner though as all they'd done was gray face plates. He says it makes a world of difference having the entire skimmer gray. Once we had them put in last year the owners of the company made them a line item option along with backfilling with gravel. Both things we pushed for during our build. Thank you for posting! We decided to go with the Latham Natural grey, no border as well. Such a hard decision!! Are you happy with borderless? 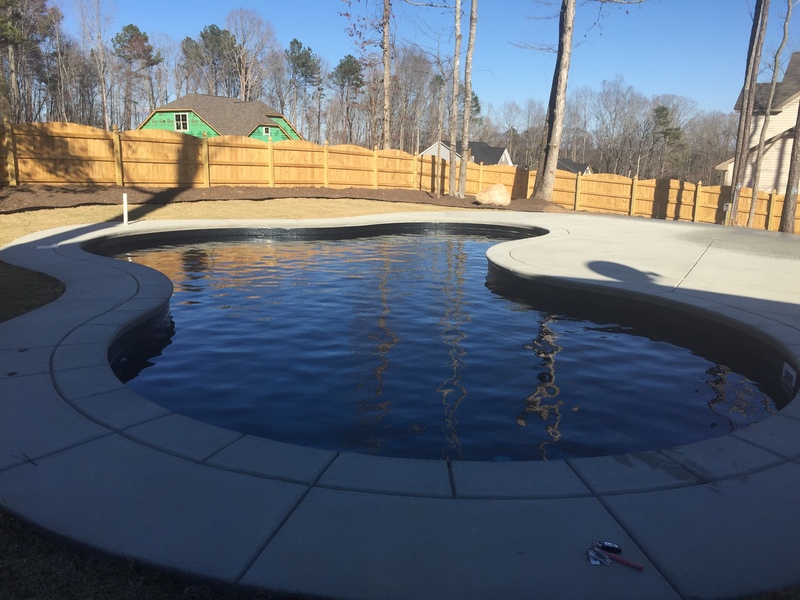 We were hoping to get a more "gunite" look...do you find that you get that with the liner? So happy to find this thread! I am completely undecided between the Grey mosaic or Natural Grey..I would love to see more pictures of any of the "grey" family of Latham liners. Thank you so much! Anyone have pics of black onyx liner from loop loc??? Help!!! Needing Pics of Latham Gray Mosaic!